Cable has one of the most complicated histories of Marvel Comic characters. 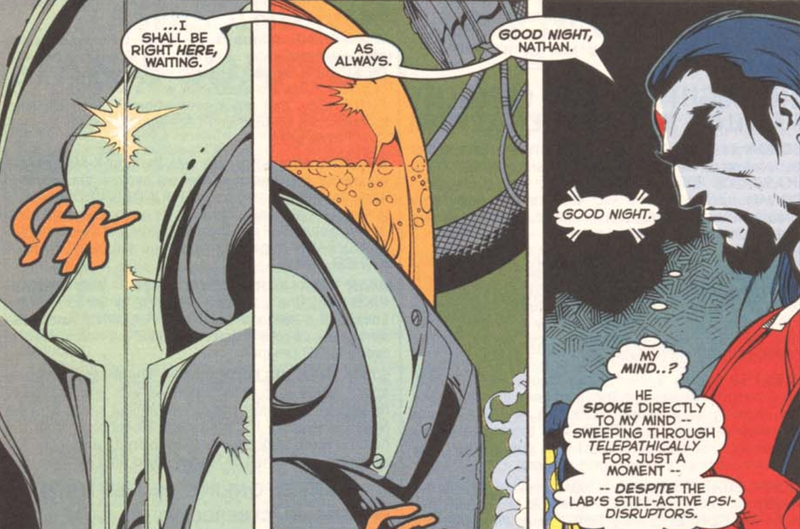 Born Nathan Summers, he’s the son of Scott Summers AKA Cyclops and Madelyne Pryor AKA the Goblin Queen. His mother was the clone of Jean Grey, making Nathan the child of two of the strongest sets of mutant DNA to begin with. Nathan’s childhood was manipulated by villains Mister Sinister and Apocalypse, sending him on a whirlwind of adventure before he could make any of his own decisions. His mother tried to sacrifice him to bring a demon to power; Apocalypse kidnapped him, subjecting him to a techno-virus; he was sent to the future for a cure and became an experienced time traveler and team leader. He was also cloned and traveled back to his own parents’ time as a mercenary. Of course, Jean and Scott also spent a little time raising him in the future when their minds time travelled as well. Complicated! His power set is almost as complicated as his backstory. While Cable has telepathic and telekinetic abilities on par with his powerful genetic mother Jean Grey, training in the future with advanced technology, exposure to Apocalypse’s techno-virus, and more also gave him unique abilities. He’s one of the most powerful mutants in the history of Marvel’s publication, making him a formidable opponent, but also a powerful ally. In honor of Cable making his live action debut in Deadpool’s sequel, we’re taking a look at his abilities with 20 Powers You Didn’t Know Cable Had. An advanced healing factor is something that runs rampant in comics. Numerous heroes and villains heal from injuries in a matter of hours that might kill an ordinary human. That’s not exactly the case for Cable. Cable has found himself with superb healing when he and Deadpool have ended up merged due to a teleportation incident. Deadpool stays alive in the most absurd circumstances because of his extremely powerful mutant healing. When their bodies merged while teleporting together, Cable had access to that healing as well. That’s not the kind of healing that Cable has as a superpower though. Instead, the healing that Cable exhibits is actually aimed at other people. In the series Cable & Deadpool, Cable ended up in another reality and deaged to an infant. When he returned to his own reality, he rapidly aged as his powers manifested quickly and strongly. During that time, Deadpool was actually brainwashed into wanting to take him out, with, as Cable discovered using his telepathy, “black spots” in his brain. Though the act could burn out all of Cable’s power, he uses his abilities to heal all those black spots in Deadpool’s brain, helping to fix the gaps in his memory and purging illness from his system. Of course, Wade’s mutation and his cancer still seem in tact after the fact, so even Cable’s immense power can’t totally heal him. It’s unclear just where this healing power comes from. An offshoot of Cable’s telekinesis, perhaps, manipulating the cellular structure in the brain? Cable’s unique aptitude for telekinesis means that he can do some really crazy things. He’s able to manipulate things at a molecular level when his power is strong enough and he’s not distracted by anything else in his environment. While that means he can do cool things like moving oxygen molecules to change someone’s ability to breath, it also means completely breaking molecular structure down. Cable has demonstrated a proficiency with disintegration in the comics in particular. He can actually break about the molecular structure of an object so that it essentially vanishes. Now, as far as readers know, this only applies to inorganic material, so he can’t disintegrate people. Because he can’t seem to make this ability work on living things, plenty of fans believe that his ability to disintegrate objects might not actually be a factor from his telekinetic powers, but a whole new power on its own. This power, however, could also simply be an offshoot of him being able to manipulate things at their smallest level. He was, after all, able to make a man grow wings in the Soldier X series when he was asked to make someone fly. If he’s able to rearrange molecular structure like that in a living being, breaking down an object should be a piece of cake. 18 Hosting A Spaceship’s A.I. When Nathan Summers was sent into the future in order to survive the techno-organic virus he was exposed to, he became known as Nathan Dayspring. He also lived with Clan Askani and was prophesied to be their savior. During the miniseries Askani’son, readers were able to see what Nathan’s life was like in the timeline where he grew up. As a result of his exposure to the techno-organic virus and aptitude for telekinesis, Nathan had a natural gift for technology. That gift seemed to also extend to hosting the artificial intelligence unit of a spaceship in the middle of his chest, as crazy as that might sound! Following the defeat of Apocalypse in the miniseries, new dictators filled the power vacuum and Nathan spoke out against them. In return, they imprisoned him. 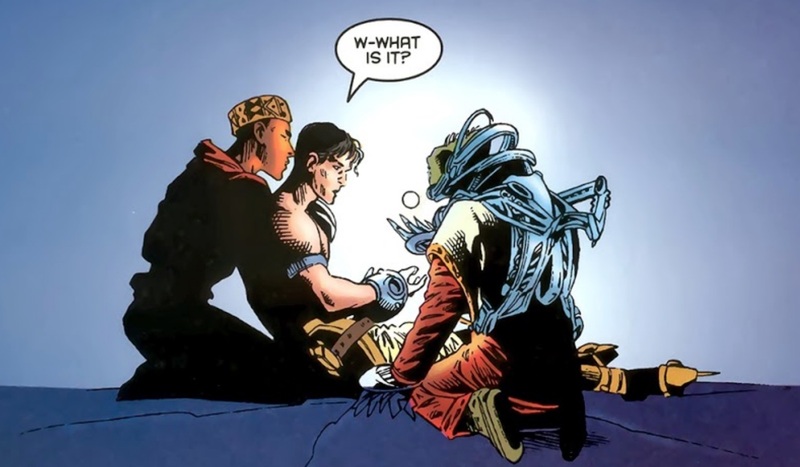 It was one of his fellow Clan Askani members who broke into his prison cell to help him, but to his surprise, they extracted a ball from the middle of his chest. His chest was organic metal, part of where the techno-virus had spread. The orb was the artificial intelligence for Ship. Ship was an ancient A.I. created by the beings called the Celestials and was later enslaved by Apocalypse. The A.I. didn’t remember itself and gave itself the name Professor instead, becoming Nathan’s ally. Ship actually helped send baby Nathan to the future when he first got sick and stored some of itself inside him! The entire point of Scott Summers not raising his son and sending him to the future with a woman he didn’t know was to make sure Nathan got the cure for the techno-virus. Little did Scott know that his son would never be fully cured. When Nathan was first taken to the future as an infant, members of Clan Askani didn’t think he would survive, that the virus had already spread too far. They decided to clone him instead, and see if they could make sure the new baby survived. To their surprise, Nathan managed to keep himself alive, and it was actually his telekinetic abilities that kept him going after that. The techno-organic virus that Apocalypse exposed Nathan to created organic metal that moved through his body. Once the metal was able to travel through Nathan’s system, it would kill him. Unfortunately for Apocalypse’s big plan, Nathan grew into being one of the world’s most powerful telekinetics. In case it wasn’t clear, telekinesis is the ability to move things with your mind. In Nathan’s case, he can use his telekinesis at a molecular level. His power is so strong that he can actually mentally block the virus from spreading. That kind of detailed use of his power requires immense focus - and requires him to maintain the virus at all times. That means his telekinetic power is always in use, making it hard for him to ever use the full extent of his abilities in any other situation. One thing comic books have taught readers is that many telekinetics aren’t more powerful simply because the concentration required for large scale movement with their mind is too much of a strain. That’s especially true for someone like Cable who always has to keep the virus inside of him at bay. When he’s able to unleash his powers though, he goes big. The Graymalkin, named after the original address for Professor Xavier’s School For Gifted Youngsters in the comics, was a space station. It’s the same space station in which Cable travelled to the past in his quest to defeat Apocalypse. He kept the Graymalkin in orbit around Earth, using it as his home base. 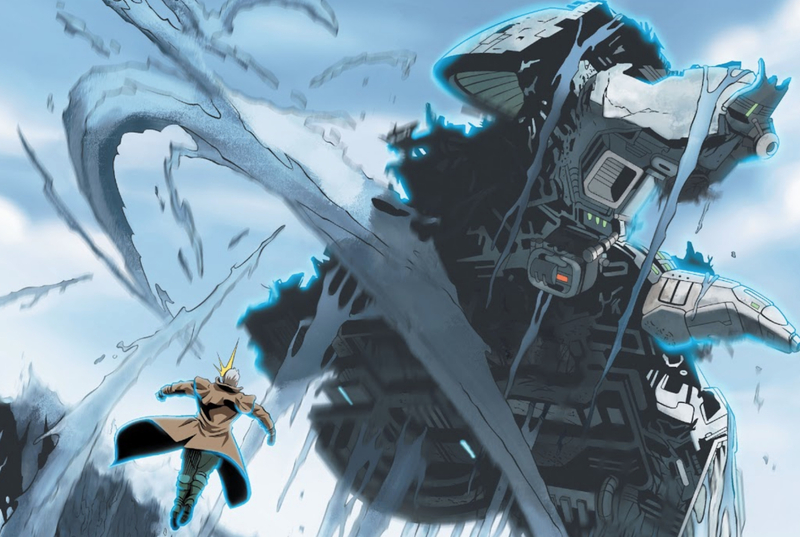 Unfortunately for Cable, the Graymalkin was nearly destroyed in a massive fight between S.H.I.E.L.D. agents and X-Force. The space station attempted to self destruct, so its pieces were put deep into the ocean for the protection of the planet. Long after it had been abandoned, Cable was actually able to use his telekinesis to lift them from all over the ocean to use it as a base to form his own island. If that’s not impressive enough, during a fight with Silver Surfer, the two destroyed whole sections of a major city, but you wouldn’t know it. Why? Because as fast as they vaporized buildings and tore through walls, they rebuilt them with their telekinetic abilities. Now, that’s impressive! Most of the time, we don’t think of charisma as a superpower. Instead, it’s a way to explain that someone is charming. Charm, however, leads to a person being able to persuade others. It’s the power of persuasion here that leads to Nathan’s charisma being particularly impressive - or at least one version of Nathan. 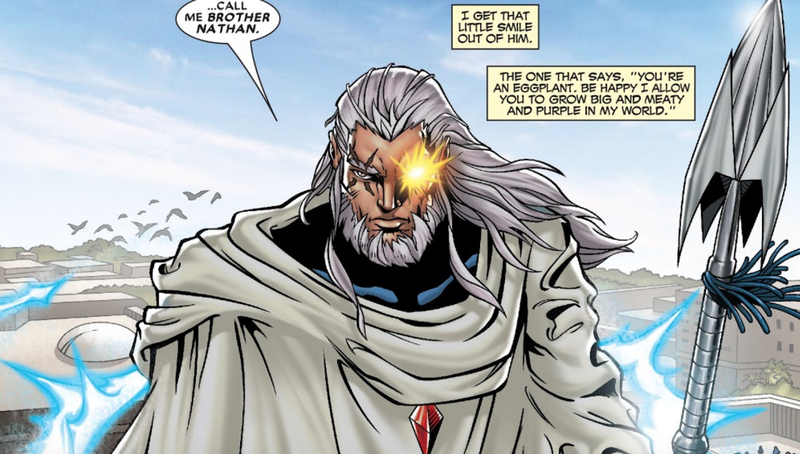 Nate Grey, much like Nathan Summers, was created thanks to some manipulation on the part of Mister Sinister. While Nathan Summers was born from a clone of Jean Grey and the real Scott Summers, Mister Sinister created Nate from the genetic material of the original Scott and Jean both. Of course, these two existed on a different world, making Nate the Cable of Earth-295. Nate, who briefly went by the name Shaman before settling on X-Man, ended up on the main Earth’s continuity by mistake. He travelled to many alternate realities, meeting many different versions of himself, but it was an introduction to the villain Purple Man that revealed Nate had a certain charisma. 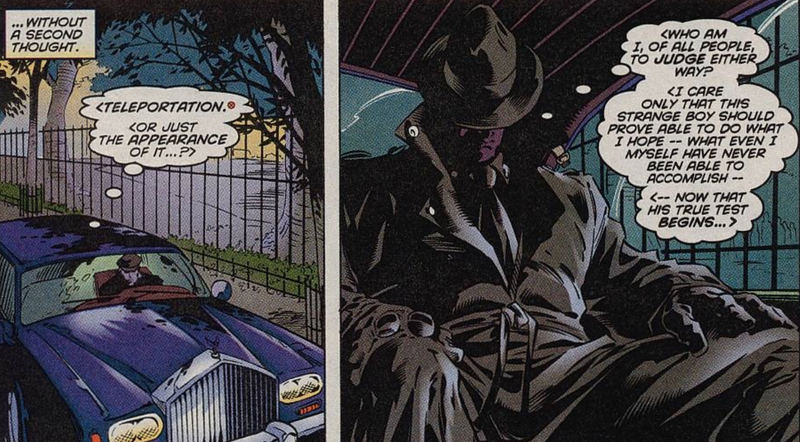 Netflix fans will remember Purple Man as Killgrave, the villain of Jessica Jones. The comic book and TV characters can control others with a simple command. Not much impressed Purple Man when he met heroes, but Nate did. Nate had a natural charisma that drew people to him who wanted to help him, something Purple Man couldn’t manage without making an order. The ability to see into the future is one granted to only a few heroes in the comics. It’s actually very rare for any mutant in Marvel’s pages to be precognitive. After all, if a character always knows what’s going to happen next, the story is either very predictable or always spent trying to prevent those events from happening. Most recently, Marvel has played with the implications of precognition in their second Civil War event series as the mutant Ulysses foresaw the death of Spider-Man at the hands of Captain America. It led to a discussion of just how much heroes could prevent the future. On the small screen, Agents of S.H.I.E.L.D. has tackled a similar idea with their season five storyline involving time travel and a time loop. Cable didn’t get his precognitive ability thanks to his own mutation or his extensive time travel though. 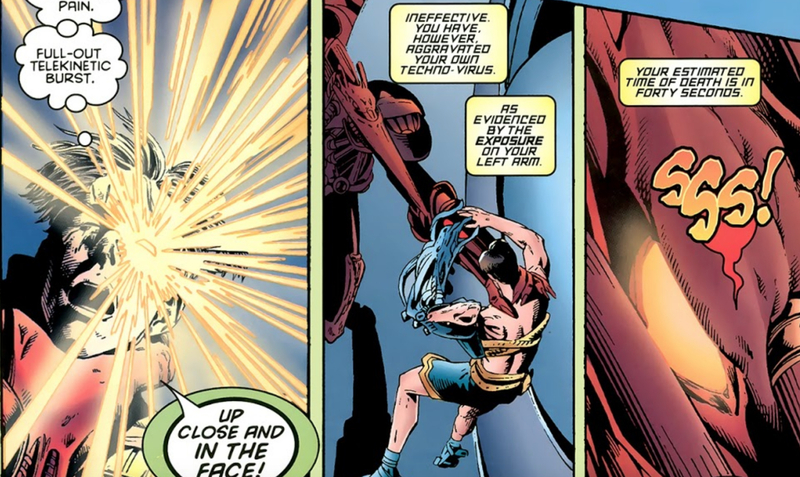 Instead, he got it from a Deathlok. Deathloks are beings in the comics who are as much machine as they are human. 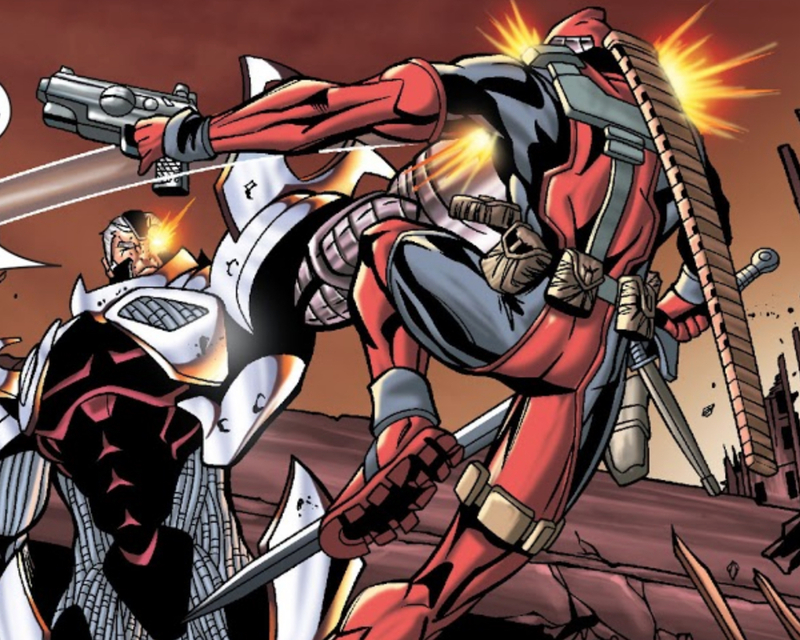 Many characters have become a version of Deathlok over the years. 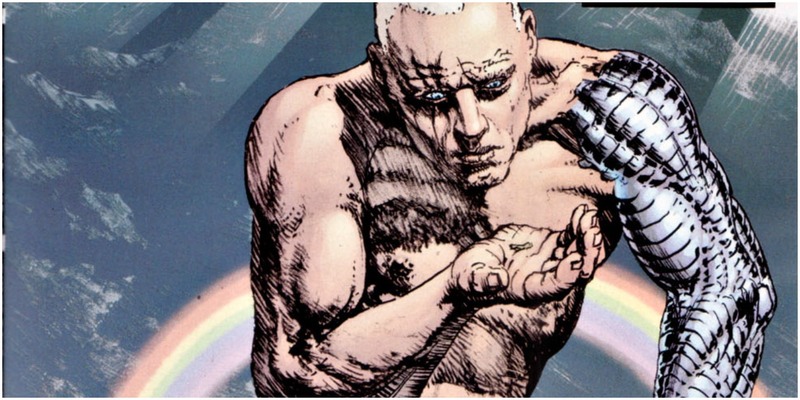 In Cable’s case, his brain was manipulated using Deathlok technology to be able to see the future. Unfortunately, the ability to see also caused Cable to develop a tumor that actually ate into his psyche. The rest of his powers dampened. Once he was cured, his other abilities returned to full force, but his precognition is limited to a few moments out instead of years. Comic books have had many different version of “physical” psychic weapons over the years. Psylocke has her psi-blades. Even Gambit’s playing cards are imbued with his own special energy signature. In Cable’s case, he rarely uses a physical version of his mental abilities. One alternate reality version of him sure liked his telekinetic bolts though. During the Cable & Deadpool series, Deadpool found himself traveling through alternate realities, trying to track down “his” Cable. Deadpool had actually been brainwashed to take out Cable, though no one else knew that when their search began. The X-Men characters Cannonball and Siryn travelled with the mercenary, using the fact that Deadpool was “tuned” to Cable’s frequency to allow them to teleport after him. They travelled through a handful of realities to track Cable down, but one painted a grim picture of the hero. Cable was originally schemed into existence by Mister Sinister so that the hero could bring about an end to Apocalypse. On the Earth with the designation 5701, not only did Cable fail to stop Apocalypse from taking over, but he became one of the villain’s Horsemen. As the Horseman of War, Cable’s powers were even stronger and more destructive. It was there that he had a love for Telekinetic Bolts, physical manifestations of mental energy that he aimed at his opponents. 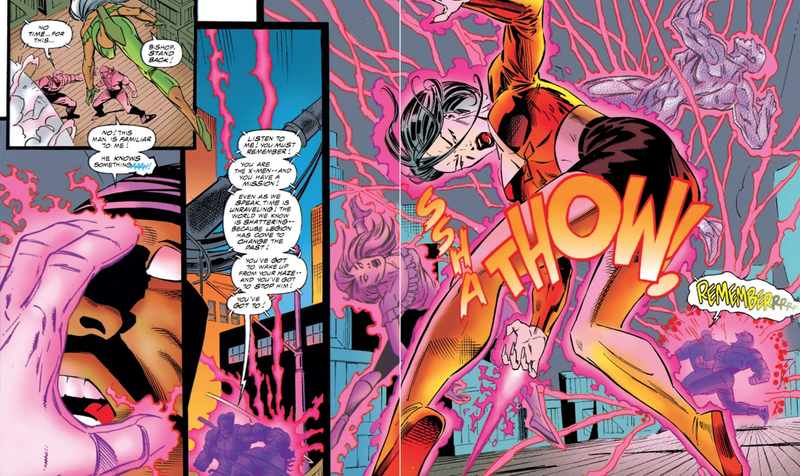 In addition to bolts, Cable has also demonstrated the ability to create telekinetic spikes and concussive blasts in other realities. Garden variety telepaths can read minds in comics. Exceptional telepaths can influence those minds, which is part of what makes them so scary. They can “push” thoughts into the minds of others, sometimes so subtly that the subject doesn’t even know it happened. Movie fans will be familiar with the idea of “pushing’ a concept into someone’s subconscious thanks to the huge success of Inception, but it’s been going on in comics for much longer. In some alternate realities, Cable has actually been able to push commands into the minds of animals to get them to be less aggressive. He once commanded a dinosaur to stop attacking! In the normal continuity, designated Earth-616, Cable’s use of this ability only works on intelligent beings, so we’ve only seen him use it on humans, not animals, though that could always change. The most common use of it in the comics is actually on other mutants! Cable has used his ability during a fight to get another mutant to turn their abilities on or off. Sometimes, it’s not even during his own fight. When Domino and Copycat, who had masqueraded as Domino for over a year, met up and got into a fight, Cable actually brought the fight to a halt by “turning off” their mutations. He surprised the two so much, especially the shapeshifter Copycat, that both women stopped fighting. When comic book readers think of characters that can change their size, they usually think of characters like Ant-Man and Wasp, not telekinetics. Cable is one of the rare characters that can do it too. It’s a rare ability that he doesn’t pull out very often, but readers got to see it in action inn the Soldier X series. There, he was able to increase his size so that he briefly became a giant. His size allowed him to not only provide a distraction point for enemy forces, but to also scare them away. What’s most interesting about this ability is that there’s really no reason that Cable is able to do it. Before he tried it, there wasn’t an indication that this was another mutation the time travelling soldier had up his sleeve. Instead, fans theorized that it’s yet another benefit of his impressive telekinetic abilities rather than his telepathic ones. He could have used telepathy to simply make people believe he was a giant, but instead, it appeared that he actually was a giant. Cable uses telekinesis to move things and to keep his virus under control, but he also uses it in a variety of other ways. He can use it to create physical manifestations of his power, fly, increase his own strength, etc. Why not use it make himself bigger? There’s likely a complicated sci-fi explanation about spaces between molecules or something similar that means Cable could do this again. When there are a large number of superheroes in Marvel comics that have telepathic abilities, heroes and villains alike have to take steps from their minds being invaded - even accidentally. Juggernaut and Magneto both wear special helmets. Others have been trained to withstand psychic attacks, constructing “psi-blocks” in their minds. Mister Sinister has the technological version of those. Sinister AKA Nathaniel Essex is obsessed with genetics. A scientist who fell out of favor in his day, he kept working to create the perfect biological weapon, focusing his obsession on the Summers family. It was Sinister who cloned Jean Grey and gave Scott Summers his wife, Madelyne Pryor. 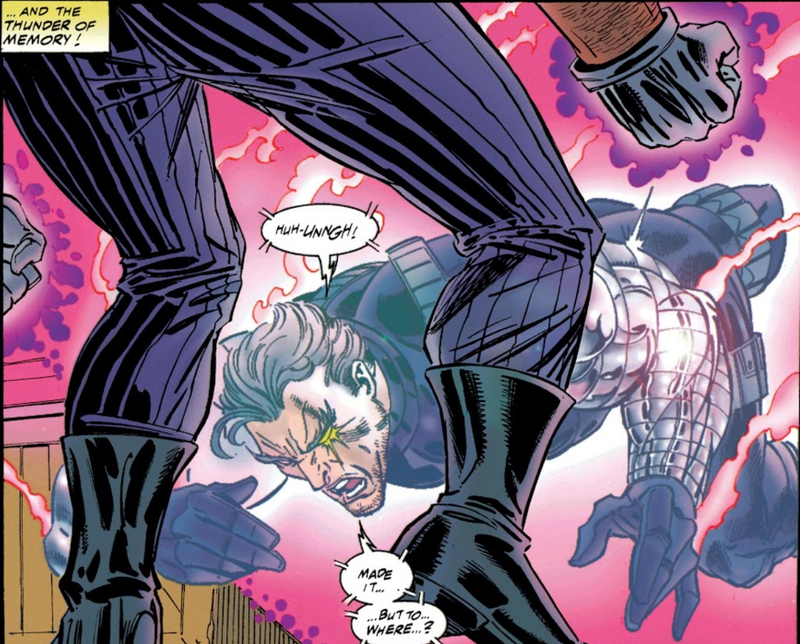 In addition to being the one setting the wheels in motion to create Cable, Sinister also created Nathaniel Grey, the Earth-295 version of Cable. He genetically engineered the boy in his lab in an effort to create a weapon to bring an end to the villain Apocalypse. 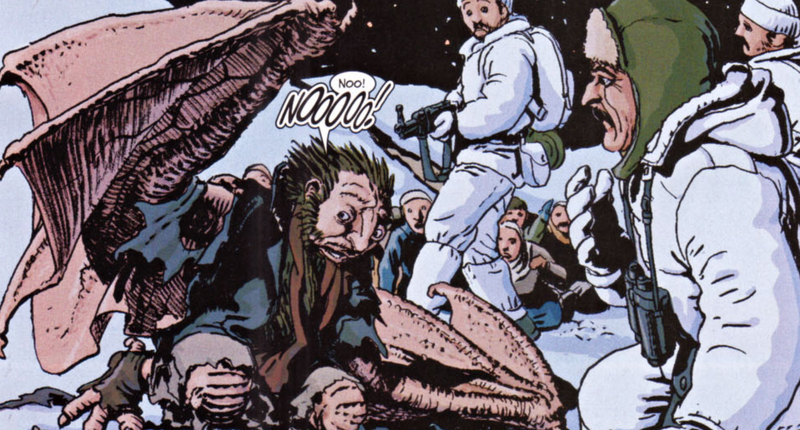 He got a little more than he bargained for though, as revealed in the special Minus 1 issue of X-Man. In it, Nathaniel Grey was briefly out of his incubation pod, proving just how powerful he was by astral projecting both himself and Sinister into Apocalypse’s prisons long before Sinister thought he would be able to. He also was able to telepathically communicate with Sinister despite the psi-block measures in place in the lab. Nathaniel Grey didn’t even know he was doing it yet, a sign of the power yet to come! Considering time travel is such a big part of Cable’s story, you might be surprised to see it listed as a power you didn't know about. The trick is, of course, that time travel isn’t usually one of Cable’s abilities. He has technology that helps him do the traveling. His Body Slide is essentially a teleportation device. In some instances though, Cable has such command over his own abilities that he doesn’t need technology to do it. Readers often view teleportation as a unique ability. After all, if a character like Nightcrawler’s claim to fame is that he can disappear from a space in a puff of smoke, that’s what you remember him for. Cable’s command over his telekinetic power though reveals that teleportation could be thought of as an extension of telekinesis. It’s not a huge leap to think that a powerful telekinetic could incorporate this super fast method of travel into their repertoire. Jean Grey and many other powerful telekinetics are already able to make themselves fly by lifting themselves through the air. Teleportation and time travel is just an extension of that. Cable, or really the Nate Grey version of the character, is able to use his telekinetic power to move the molecules of his own body through space and time. He even manages to travel through alternate realities without the aid of a Body Slide. Cable has managed to do it a handful of times, but it’s not a skill he’s been able to master yet. Telepaths are able to shield their minds from mental invasions. Telekinetics are often able to shield their bodies from physical ones. Cable can do both, but his force shields, a result of his telekinetic skills, are very impressive. Cable is able to construct a shield around himself and those closest to him. Just how far he can extend it is unknown, but he’s been able to do it around whole groups of fighters in New Mutants and in his own solo series. The shield prevents anyone inside of it from being hit with physical objects, energy projections from those with similar skill sets, or even fire. Some fans speculate that Cable’s force shield could even withstand the force of a nuclear bomb if he was able to use the full extent of his powers. Movie audiences get to see a little bit of Cable’s shield work in action in Deadpool 2, along with many of his other abilities. It’s not made clear in the movie if his abilities are a result of his mutations, like they are in the comics, or if they’re a result of future technology, like his time traveling device is. Future movies might paint a more definitive picture. Reaction time varies for you average human beings. Some have quick reflexes and can hone their skills with training, while others don’t care. In the case of superheroes, a quick reaction time is needed to take on serious bad guys. Cable has one of the fastest. Of course, You don’t get a reputation for being one of the best hand-to-hand fighters in comics without having an excellent reaction time. It’s a necessary skill. Cable as Nathan Dayspring spent his childhood in a land ravaged by Apocalypse. Despite the dangerous atmosphere, he got a lifetime of training in a decade. Cyclops and Phoenix were psionically kidnapped and their minds were sent to bodies in the future where they raised Nathan. The two of them didn’t just protect him from the bad guys of the future; they also trained him the way they were trained as X-Men. Nathan learned how to use his telekinetic and telepathic gifts courtesy of the Phoenix. He also spied on his parents as they led raids against Apocalypse’s forces. That childhood prepared him to become Cable, the kind of mutant who could gain an edge in a fight. A combination of his own physical training and his telepathy and telekinesis allows him to react faster in a fight - throwing up shields and staying one step ahead of his enemies. Psychics, telepaths, and psionic abilities in general can create a lot of headaches for comic book characters. Sometimes, those headaches are metaphorical, but sometimes, they’re literal. When Professor Xavier’s son David Haller decided to take a trip through time and try to change literally everything the X-Men had ever done, it created a bit of a conundrum. During the course of David’s fight with the X-Men, Storm had the idea to latch onto his psionic energy, instructing Psylocke to link them to their enemy. As a result, Storm, Psylocke, Bishop, and Iceman all travelled to the past when he did. Unfortunately, there was a side effect following the powerful telepath: gaps in their memories. David AKA Legion decided to change the way history unfolded by going after his father and his friend Erik before they became Professor X and Magneto. The X-Men were there with the intent to foil his plans, but they didn’t know that thanks to the gaps in their memories. Cable, sent on a quick time travel trip of his own, was supposed to help them. Instead, Cable’s time in the past was very brief. While he did make contact with the X-Men, they thought he might have been an enemy because they couldn’t remember him. Cable used his own psionic ability to try to get to Bishop. It was Bishop’s memories that Cable was able to unlock and restore, giving the X-Men their lives back. When you see the words “adamantium” and “claws” together, the mind immediately goes to Wolverine, as it should. He’s the most famous of Marvel characters to have adamantium in his body and his popularity has hit the stratosphere thanks to Hugh Jackman’s portrayal on the big screen. There is, however, more than one version of Wolverine. The Ultimate Marvel comics is a very different universe than the ones readers know and love. In it, the characters they know have very different traits. Black Panther is a subject of the Weapon X program, Black Widow and Iron Man almost get married before she betrays him, and Hawkeye gets a little bloodthirsty when he loses his entire family. 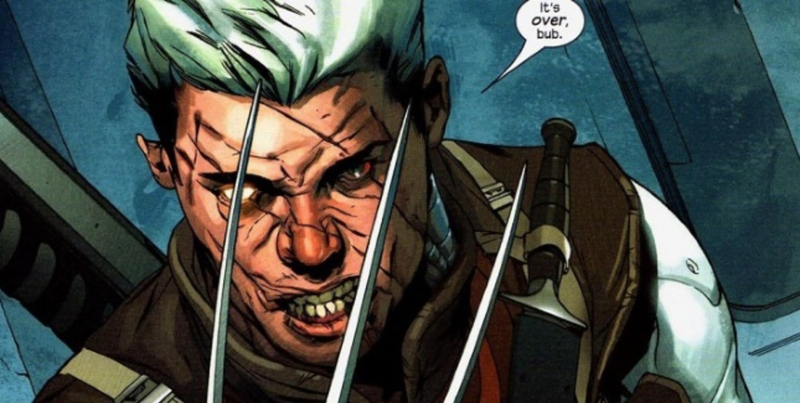 In the Ultimate Universe, Cable isn’t exactly Cable and neither is Wolverine. The version of Cable that exists in the Ultimate universe doesn’t have the same power set of the Cable as the usual Marvel continuity. Instead, he’s got his own set of adamantium claws in the future because he becomes one version of Wolverine. His name is James Howlett. One storyline saw him travel to the past to kidnap Professor Xavier in hopes of using his abilities in a fight against Apocalypse. During the course of the kidnapping, he revealed his claws while he fought the earlier version of Wolverine. With a scar on his face and one metal arm though, he still used the codename Cable. The Ryan Reynolds version of Deadpool would probably love to riff on that. While Cable spends a lot of time traveling between timelines and realities in the comics, one thing a human body can’t do is physically hold open a time portal to allow people to go through. That, apparently, breaks the rules of science fiction set by comic book writers. Cable, however, isn’t entirely human. One of the biggest flaws for Cable is that the techno-organic virus stops him from using the full extent of his powers. It means, for all the power he has, he can’t access it. 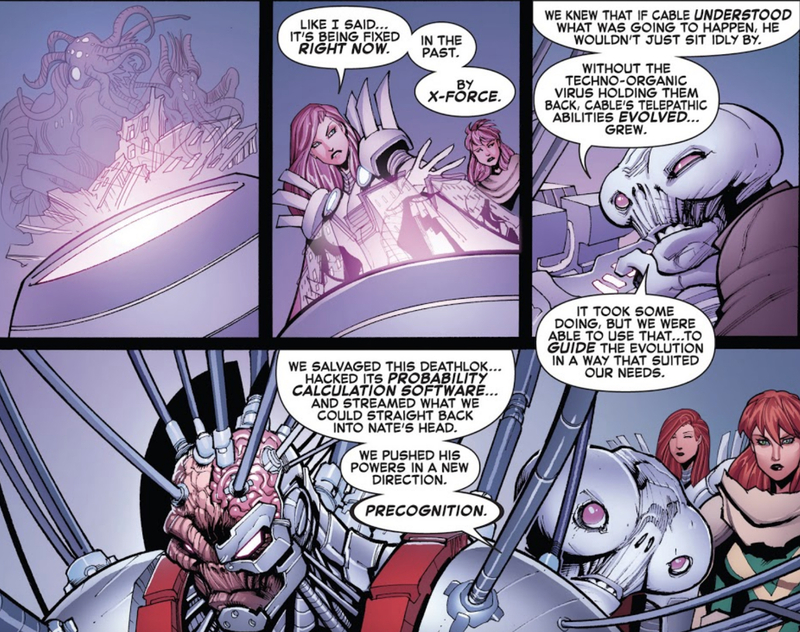 In one X-Force story, he stopped trying to control the virus completely instead of using his powers to keep it at bay. 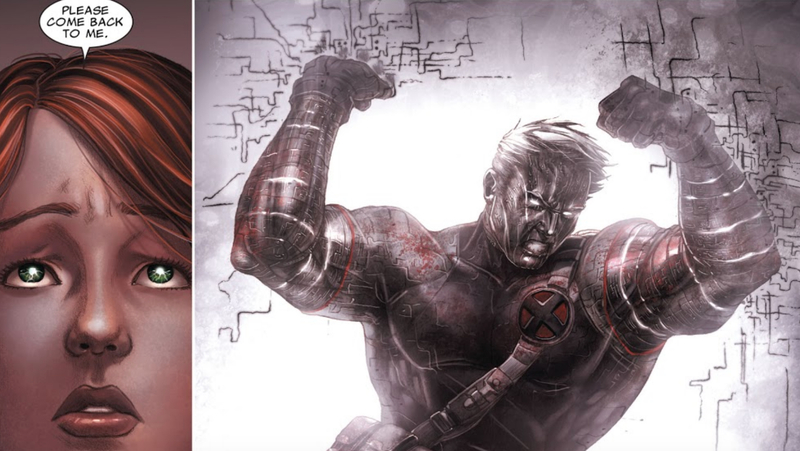 In this particular story, Cable raised Hope Summers to be a teenager in the future and the duo returned to the past where they worked with the X-Men. When they did, a villain called Bastion sent his robotic sentinels to attack the X-Men. Cable used the same time portal Bastion did - which was designed to only allow technological pieces to pass through - to save members of Wolverine’s X-Force team. Cable allowed the virus to take over so that he could hold the portal open long enough for the team to pass through. Unfortunately for Cable, that meant he also allowed himself to be consumed by the portal, seemingly sacrificing himself, though he later ended up being displaced in time. One of the many versions of Cable that existed in other realities was Brother Nathan. Interested in a peaceful planet, Brother Nathan was unlike the violent versions usually found in other realities. During the Cable & Deadpool series, Cable ended up in another reality with Deadpool hot on his trail. Deadpool tapped into Cable’s energy from their time synced together in order to follow him across other realities. When Deadpool found himself on this particular planet, he discovered that there were no weapons or fighting of any kind. There also wasn’t even television or indigestion as Brother Nathan set up a warning system for every little thing to give people the help they needed. This particular world creeped Deadpool out more than any other version he’d visited. There was something about Cable achieving world peace that didn’t sit right with him. In fact, while on his search, mutants Cannonball and Siryn were following Deadpool at a three minute delay, bouncing through realities behind him to track down Cable as well. As soon as the duo made their way to Brother Nathan’s world, Deadpool moved ahead to the next with no explanation, not wanting to spend another moment in a land with world peace. There is almost no greater power in Marvel Comics than that of the Phoenix Force. One of the oldest entities in all of the cosmos, it’s said to be the nexus of all psionic energy that will ever exist. The best known host of the Force in the comics is Jean Grey, but she isn’t the only one. Jean has been a draw for the Phoenix over the years and has been one of the most powerful hosts. The Phoenix has also been forced to inhabit new hosts from time to time, even splitting its force between many beings in recent stories. Next to Jean, the most powerful host might be Hope Summers, also known as the mutant messiah and a young girl raised by Cable. Cable hasn’t exactly been the host of the Phoenix, but he’s come close. In a What If? issue of Marvel that explored what happened when Vulcan, one of the Summers brothers became host to the Phoenix Force and destroyed the Shi’ar Empire. He also attempted to take on his family while playing host: Cyclops, Havok, Cable, and Rachel Summers, the previous host for the Force. Despite all four of them being no match for the Phoenix Force in normal circumstances, they were all able to hold their own against him, using the same abilities he did. It’s a rare instance where it appeared the family was able to use their bond to tap into the power themselves. The Avengers and The X-Men (and the many other extended groups of both) often find themselves on the opposite end of conflicts. Even though some of the members of the teams have crossed lines to join both (or more) groups, it seems they can never agree on anything. Every so often though, they have to unite against a common threat, which is where this unique ability comes in. The Avengers and members of the X-Men joined forces against larger villains, specifically the Red Skull. 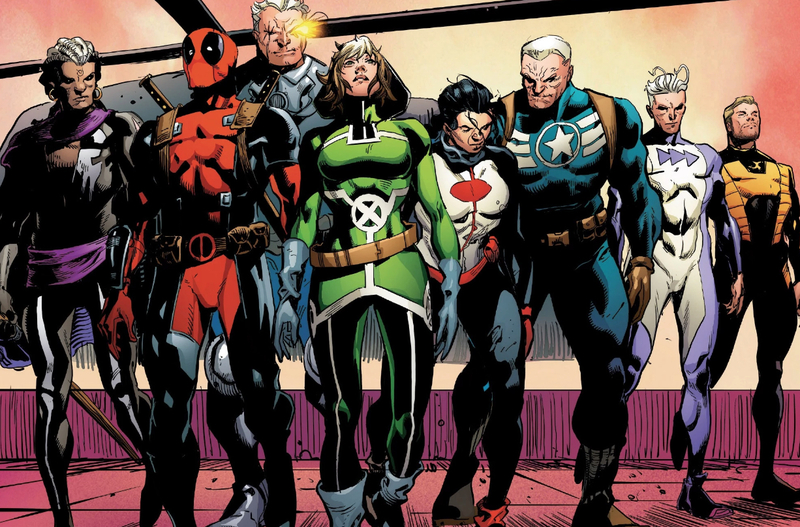 Cable got members of the Avengers Unity Division to help him with a few questionable acts for the greater good. Captain America ended up dissolving the squad. He believed too many members broke the rules, but that didn’t mean they weren’t done going up against the Red Skull. The Red Skull had actually planted a trigger inside the mind of Quicksilver, a member of both the Avengers and the X-Men on more than one occasion, and, of course, a member of the Unity Division. Red Skull wanted to use the trigger in Quicksilver’s mind to help him take over the minds of the other heroes. Rather than allow his mind to be taken over by the enemy, Cable did the unthinkable; he completely wiped his own mind of its consciousness. As a result of the mindwipe, Cable was comatose for the bulk of the ensuing conflict. The Inhuman Synapse helped him. Able to affect brain waves and manipulate people’s minds, she was able to bring his consciousness back. Did you know that Cable had all of these abilities? Or did we surprise you? See some of what Cable can do on the big screen when Josh Brolin brings him to life in the Deadpool sequel.